Marcy Yellin of Music with Marcy​ leads this perfect afternoon music class. Accompanied by the magical sounds of Marcy's guitar, children sing and play with musical instruments, scarves, sticks, bubbles and the parachute. Through music, children learn rhythm, listening skills, language and counting as well as strengthen their dancing muscles! This laid back class will get you through the witching hour as children are mesmerized by Marcy's voice and guitar. Come join us for some fun with rhythm and learning!! We are thrilled to have Joyce from Wiggles & Giggles teach for us at Marblehead Parenting! Joyce's classes are adored by children and families all over the North Shore. 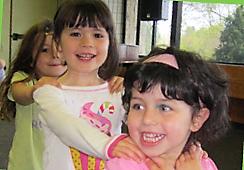 Her classes incorporate a number of themes and activities through songs, parachute play, puppets, finger play, and games that develop both fine and gross motor skills. The kids have fun, while they learn and play. With the focus on having fun, Wiggles & Giggles is the kind of high-energy entertainment that children—and parents—love. Come sing songs and hear fun stories with Spencer! This program features upbeat tunes, both familiar and brand new, along with bright and colorful picture books for young children. This mid-day class is perfect for getting your wiggles out after lunch - especially for non-nappers! Caregivers - bring your coffees, relax, and let Spencer entertain your kids! Best for ages 2-5, but younger kiddos are welcome to join in on the fun!